The United States Forest Service (USFS) is an agency of the U.S. Department of Agriculture that administers the nation’s 154 national forests and 20 national grasslands, which encompass 193 million acres. The United States Forest Service (USFS) is an agency under the U.S. Department of Agriculture responsible for managing 193 million acres of public lands, including 154 national forests and 20 national grasslands. USFS also shares the responsibility, with state, tribal, and local agencies for stewardship of nearly 500 million acres of non-Federal forests. USFS’s primary land use programs include: forest restoration, timber harvesting, watershed management, grazing, recreation, agroforestry, wilderness management, forest health research, and wildfire response and management. The San Juan National Forest covers 1.9 million acres in southwest Colorado. Management responsibilities include: Chimney Rock National Monument, Hermosa Creek Special Management Area, Hermosa Wilderness, Weminuche Wilderness, Lizard Head Wilderness, Piedra Area, San Juan Scenic Byway, and South San Juan Wilderness. 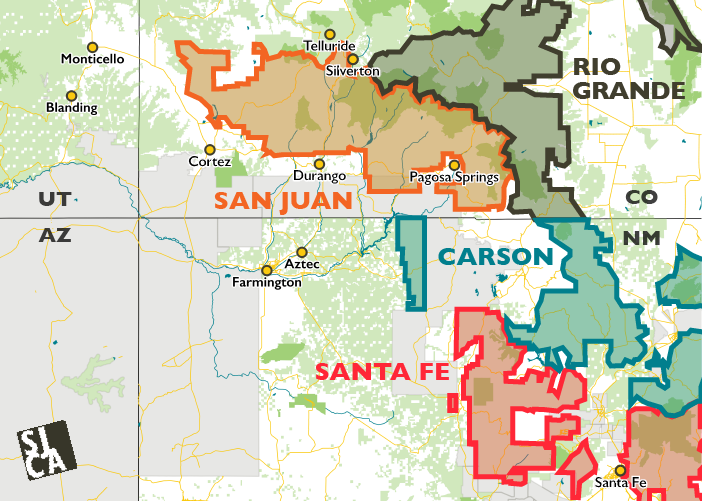 The Rio Grande National Forest covers over 1.8 million acres of public land in south central Colorado. Management responsibilities include: Continental Divide Trail, La Garita Wilderness, Wheeler Geologic Area, Silverthread Scenic Byway, Sangre De Cristo Wilderness, South San Juan Wilderness, Wolf Creek Ski Area, and the Weminuche Wilderness. The Santa Fe National Forest covers over 1.6 million acres in northern New Mexico. Management responsibilities include: Southwest Jemez Mountains Restoration, Santa Fe National Forest Scenic Byway, Jemez Mountain Trail Scenic Byway, Pecos Wilderness, San Pedro Parks Wilderness, Chama River Canyon Wilderness, Dome Wilderness, Jemez National Recreation Area, and the Rio Chama, Pecos, and East Fork of the Jemez Wild and Scenic Rivers. For 30 years we’ve fought to protect Wolf Creek Pass from an 8,000-person ski resort development. But the battle is far from over. Over 91% of public lands around Chaco Canyon in northwestern New Mexico have been leased to oil and gas drilling. It’s time to stop. Help us protect the few remaining un-drilled acres in the HD Mountains from oil and gas development.